The excel add-in MTools is a powerful software, that leverages the efficiency of your daily work with its timesaving functions and their capability of being applied to multiple (protected) sheets as well as to multiple closed spreadsheets. 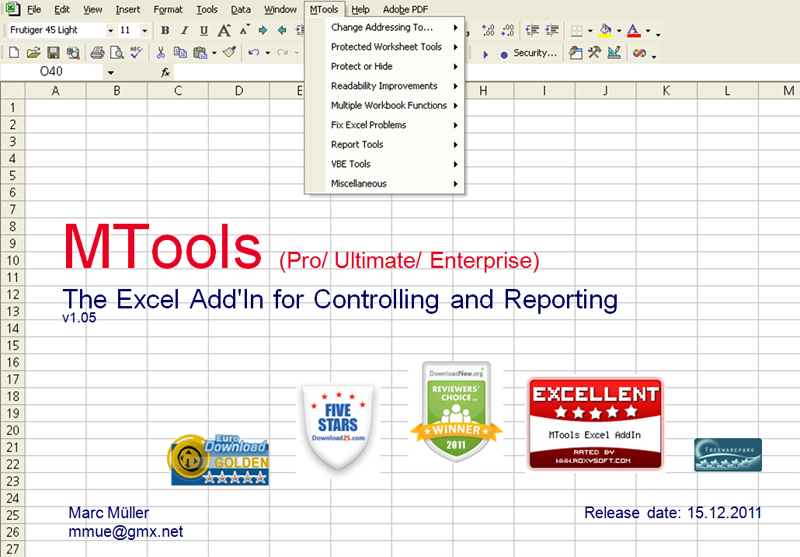 The excel add-in MTools is a powerful software, that leverages the efficiency of your daily work with its numerous timesaving functions and their capability of being applied to multiple (protected) sheets as well as to multiple closed spreadsheets. Use MTools and impress your boss with the speed and the reliability of your work or enjoy your newly gained free time by finishing your job faster than expected. This software offers a solution to users who want to convert one or more OpenOffice Writer (ODT) files into MP3 format. The user can specify the files or an entire folder to be included before starting the conversion. InfoZoom displays even extensive data volumes in a clear fashion on the screen - no more annoying scrolling. With a click of the mouse, the user zooms to the data regions relevant to his tasks and finds the desired information within seconds. Internet based professional-level dispatch and transportation management software widely used in the towing, trucking, lockout and other industries. Towing software includes: dispatch, accounting, impound, administration, reports, and mapping. Convert MS Excel files from English to Dutch and vice versa.